The news that broke earlier this week wasn't good. Chase Bank is deciding to leave to Canadian market which means their two credit cards that cardholders could still use, the Marriott and Amazon Visas are being discontinued. The good news for those who hold the Chase Marriott Premier Visa is that Marriott has teamed up with American Express to provide an exclusive offer for Marriott Visa cardholders for the Starwood Preferred Guest Credit Card from American Express. The offer sees the sign up bonus boosted by 5,000 Starpoints to 25,000 Starpoints after meeting the minimum required spend on the card as a 8.99% balance transfer for the first 12 months, which I guess makes sense for anyone who has been carrying a balance on their Marriott Visa card. 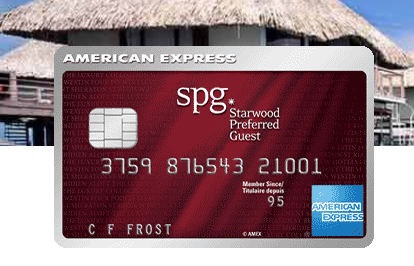 Starpoints, the currency of Starwood Preferred Guest is one of the most valuable loyalty currencies on the market today and that extra 5,000 points is a sweet deal, adding at least $150 in value to the card. Starpoints easily convert to Marriott Rewards points, all you have to do is link your Marriott Rewards and Starwood Preferred Guest accounts and then the transfers are easy. One Starpoint is worth three Marriott Rewards Points. What does that mean with the SPG Credit Card? That means the sign up bonus is equivalent to 75,000 Marriott Rewards points, the standard earn of 1 Starpoint per dollar spent is equal to 3 Marriott Rewards points and the 2 Starpoints per dollar spent at Marriott and Starwood Hotels is worth 6 Marriott Rewards points. The last offer of spend at their hotels has now been extended to July 31 from the previous end date of February 15. This offer is only available to existing Marriott Rewards Visa Credit cardholders who do not already have the SPG card beginning January 25 and those interested must opt into Marriott Rewards marketing emails in order to receive their offer. • Applications accepted January 25 to April 18, 2018. Offer valid for existing Marriott Rewards Visa Cardholders who do not already have the Starwood Preferred Guest® Credit Card and are residents of Canada. • Receive 25,000 Starpoints after they spend $1500 CAD in the first three months after opening their account. • 8.99% on balance transfers for the first 12 months. • You can earn 2 Starpoints for every dollar of eligible purchases charged to the Card at participating SPG® and Marriott Rewards® hotels through July 31, 2018. • American Express Invites™ opens the door to great music, theatre, dining, film, fashion and shopping experiences. Be among the first to know, and among the first to go!